Although many car seats are installed correctly and children are placed in the car seat correctly, there are incidents in which the car seat itself was defective, which resulted in an injury to a child. Unfortunately, a defect in the design of a car seat can result in a catastrophic injury. The following guidelines are meant to ensure proper installation, safety, and use of car seats. Never place a child or infant’s car seat in the front seat of a car equipped with a passenger-side airbag. The force of the airbag may cause the death of a child. A baby should be placed in the back seat of a vehicle. 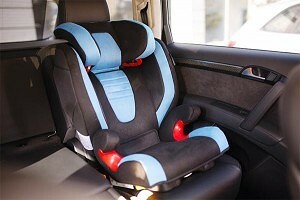 A rear-facing baby seat should not be placed where it can come in contact with an airbag. Secure the car seat tightly, allowing as little movement as possible at the base of the car seat. The harness straps should sit flat along the infant’s chest. The harness clip should lie flat at armpit level. Make sure your infant is using a car seat appropriate for their age and weight. For infants up to 1 year and 20 pounds, use a rear-facing seat. For infants one year of age and up to 30-40 pounds, use a forward-facing seat. For infants weighing more than 30-40 pounds, use a booster seat. If your child has been injured by a defective car seat, call Cellino & Barnes now at (800) 888-8888 or contact us.